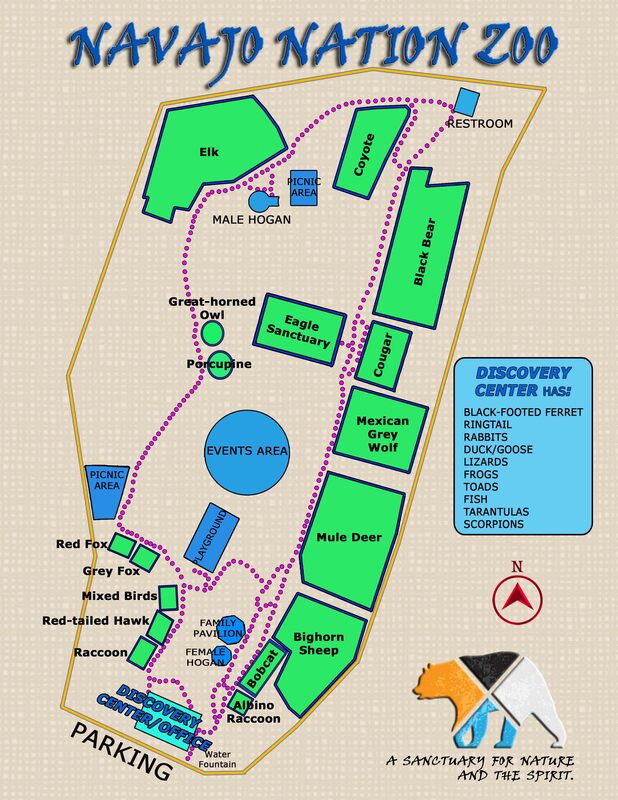 The Navajo Nation Zoo and Botanical Park is the only Native American owned-and-operated Zoo in the Country. Its humble beginnings started with the acquisition of a single orphan black bear, which was donated to the Navajo Nation in the early 1960s. After this, people and organizations starting donating more wild orphaned animals to the Navajo Nation, which were housed at the Fairgrounds in Window Rock. Because of the expanding animal collection, a more permanent location for these animals was needed to house and exhibit them. Thus, the creation of the Navajo Nation Zoo. The black bear and other donated animals were moved to the Zoo’s current location in Window Rock, about 1 mile east of the Fairgrounds. This land became “Tse Bonito Tribal Park” as 36 acres were officially withdrawn through Navajo Tribal resolution. This Tribal Park is the current home of the Navajo Zoo, Museum, and Parks and Recreation Department. The Zoo occupies nine acres of the Park, and was officially dedicated as a Zoo on July 4th, 1977. Between 1977 and 2007, the Navajo Zoo was managed by the Navajo Nation Parks and Recreation Department as the number of animals and enclosures grew from the single black bear to over 100 animals. During much of that time, the Navajo Zoo maintained a number of culturally-important domestic animals (including horses, churro sheep, domestic fowl, etc.). In 2007, the Department of Fish and Wildlife was asked to assume responsibility for the Navajo Zoo. Funding was acquired from the Navajo Nation Council with the Department’s assistance. This allowed continuation of the Zoo’s functions under the Department of Fish and Wildlife. This brings us to the current day, where the Navajo Zoo has grown and flourished under the Department. The first Zoo Curator hired by the Department, Matt Holdgate, made significant improvements to the Zoo and brought the facility to the forefront of the minds of the Navajo People and the Council. Today, the Zoo Staff continues to strive to modernize and expand the Navajo Zoo.